Do you require an activity that is both fun, educational and enjoyable for your club, society or event ? Then look no further than one of these workshop type of events. Learning how to make balloon animals or how to spin a plate in the circus skills workshop is great entertainment for both children and adults alike. It is always good for a laugh and can help to "break the ice" at many functions. The Workshops are held at your own venue and learning has never been so much fun. Kids and adults enjoy what the workshops have to offer. These involve a totally hands on approach and are great fun. Instructions are given in a clear, pleasant and fun way. As well as demonstrating the techniques , we also go round making sure that everyone is able to follow what is going on, no-one is left out. We make sure that while everyone is trying out their new skills we help each person individually so no one get's left behind. The best thing about the balloon modelling workshop is that all of the participants get to take their balloon creations home with them at the end. We show you how to make the balloon models and everything is provided. For childrens party entertainment, workshops are fun and educational, allowing children of all ages to learn new skills, build confidence and participate in a relaxed environment. They can be organised to suit any age and occasion. The workshops are provided as a hands on approach getting everyone involved. They help develop teamwork, co-operation, confidence and concentration. Workshops also help boost self esteem. We offer an exciting range of fun and practical workshops for a large variety of events including Parties, Schools, Fundays, Celebrations, Corporate events ,Youth Clubs, Guides and Scouts, After School Clubs, Special needs, Weddings, Team building, Residential Homes, Events, Fetes, Galas, Hotels, Restaurants etc. 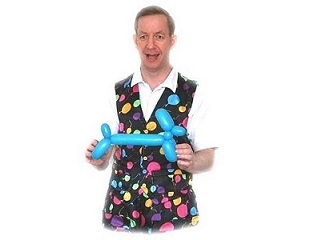 A balloon modelling workshop is a great addition to any children's Birthday Party or event such as an out of school club or activity centre where everyone can have a go at making their own balloon models Learn the art of balloon twisting with the Midlands leading Childrens Entertainer - Stuart Brown. This fun workshop will introduce children and adults to basic balloon modelling techniques while creating wonderful balloon sculptures to take home!. Learn to create lots of different items from balloon dogs to fancy hats. Fun and laughter for all! You don't need a large amount of space. It's suitable for all children of any age, and adults too. Everyone wants to have a go. Children really do love learning a new skill and the challenges that go with it. Have you ever wanted to have a go at plate spinning but thought that the idea of using your own bone china plates might prove to be a bit expensive. 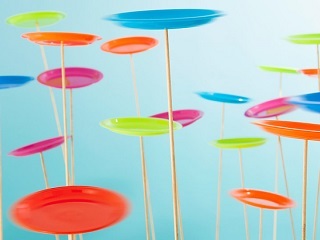 Well now you can with our super duper plastic spinning plates that we bring along to the circus skills workshops. Children and adults of all ages love the circus and this is a chance for them to have a go at some circus themed skills. The children can have a go on wooden stilts and plate spinning. For children in particular these activities are designed to help with hand and eye co-ordination and encourage children to try out new things. The workshops can also be incorporated into events such as fun days, carnivals or fetes. If you have that special day in the future and you are looking for something that is just a bit different then why not get in touch. Use the enquiry form for further details. We can provide either workshop or why not have both so that the children can have the best of both workshops. The above can also include a magic show too for the children. Just contact us with your requirements and we will suit the activities to your needs.